This is my first experience with Portland Dining Month. I’ve been hearing about it for a couple years, so I’m glad I’m finally giving it a try. My friends have had mixed reviews about their meals so I was curious how this would go. Answer: It was great! The gift certificate I won was for 23Hoyt, a restaurant I’ve driven and walked past many times, but have never eaten in. It’s as you might guess, it’s on NW 23rd & Hoyt. I didn’t realize it until getting the check at the end of the meal that it’s owned by Bruce Carey, the same guy who owns Bluehour, Clark Lewis & Saucebox. Impressive resume. We made reservations at the last minute through Open Table and found a seating at 6:45 on Saturday night. Which was surprising since it looked like every table was full while we were there. Our table wasn’t the greatest, especially for pictures, but I can’t complain with last minute reservations. So the deal with Portland Dining Month is 3 courses for $29 per person. 23Hoyt offered an appetizer, soup/salad, & entree course. There were two choices for each course so we ordered the entire menu! Oxtail Croquettes & a Winter Vegetable Turnover. (I decided to go black & white with the pics today. The dark restaurant made it tough to photograph. 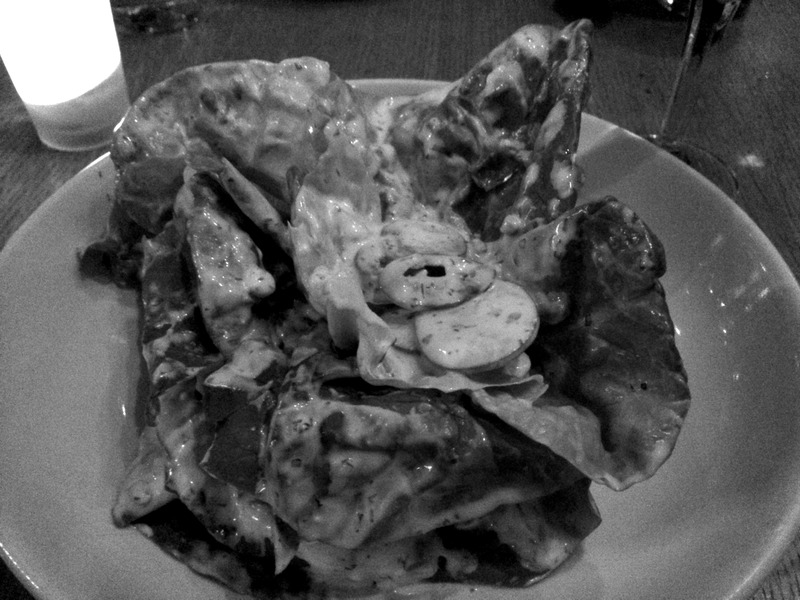 I think it the gray scale does the food more justice than the warm color temperature photos.) The croquettes blew me away! Basically crispy balls of meat served in a sweet apricot sauce. I don’t know what I was expecting, but they were really fantastic. 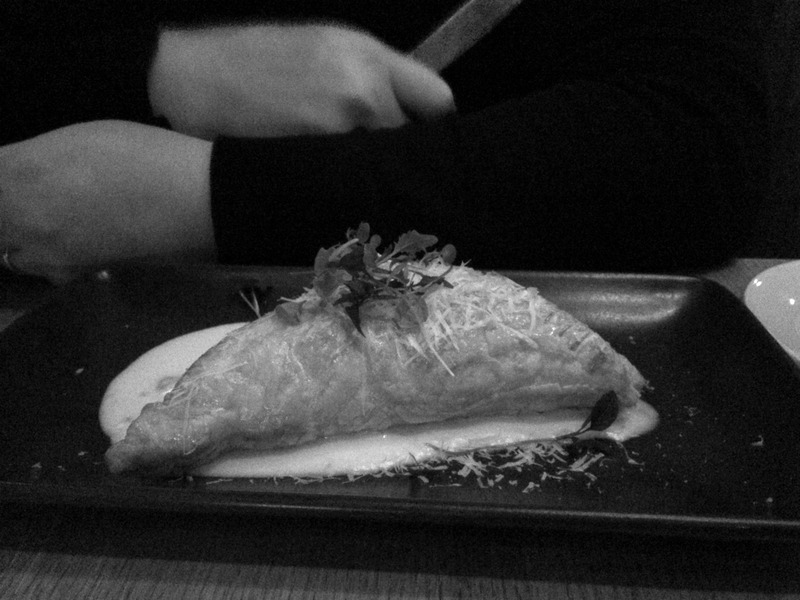 The Winter Vegetable turnover was also great. My husband was raving about the fondue sauce that covered it. It’s hard to go wrong with pastry. Butter Leaf Salad with Goat Cheese Ranch Style Dressing & Charred Tomato Soup. I was a little worried about the salad when it arrived, because it looked drenched in dressing. Not my favorite. But after taking a few bites I was totally on board! It was so light and refreshing, not at all too rich or over dressed. Pleasant surprise. I would really love a bottle of that dressing. 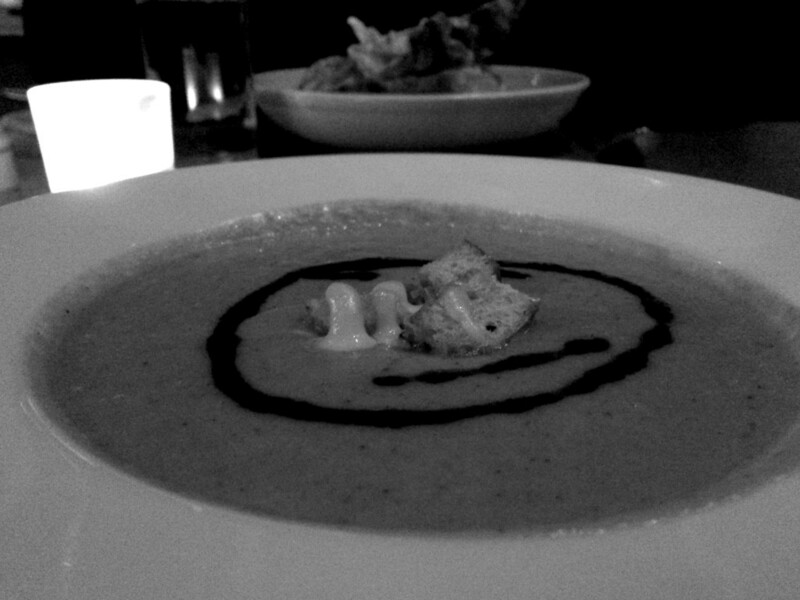 The Charred Tomato Soup was classic. It tasted like summer. I’m pretty sure all they did to make it was roast tomatoes then blend them up with some basil. I’m not complaining, it was delicious. The salad and soup alone would make an excellent lunch! Braised Duck Leg with Roasted Pear & Wild Mushroom and Squash Lasagna. 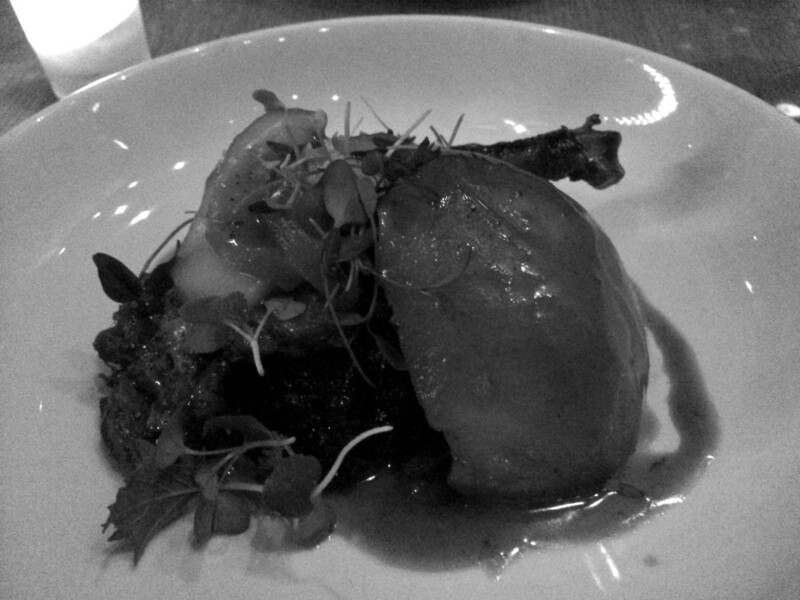 The duck was perfectly cooked, falling off the bone and the roasted pear complimented it well. Overall it fell a little bit short, it needed something, a little kick, to add an element of surprise. But we still ate every last little morsel. 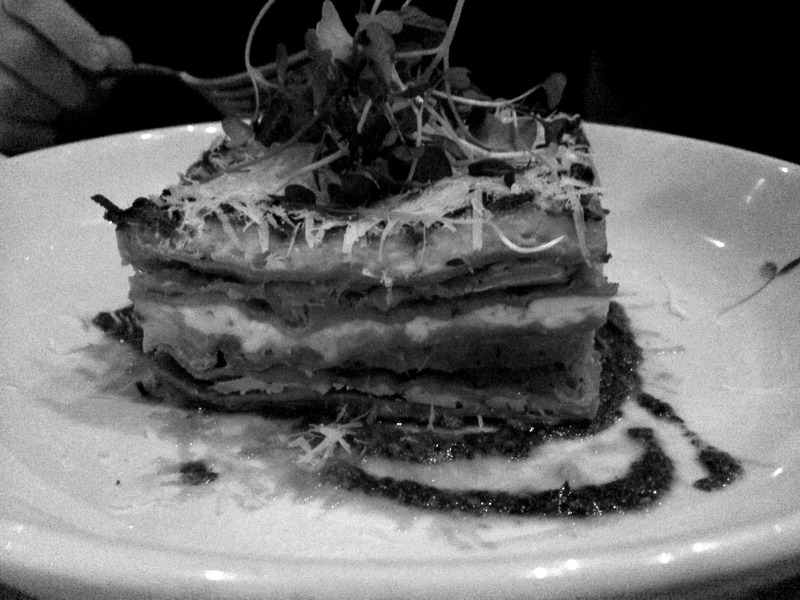 The lasagna was our our least favorite dish of the evening. It was a little dry, but the presentation was beautiful and we had fun sharing it. We are big lasagna fans and it just didn’t have that cheesey, rich, gooey essence of a classic lasagna. But I did enjoy the squash flavors. I love squash. 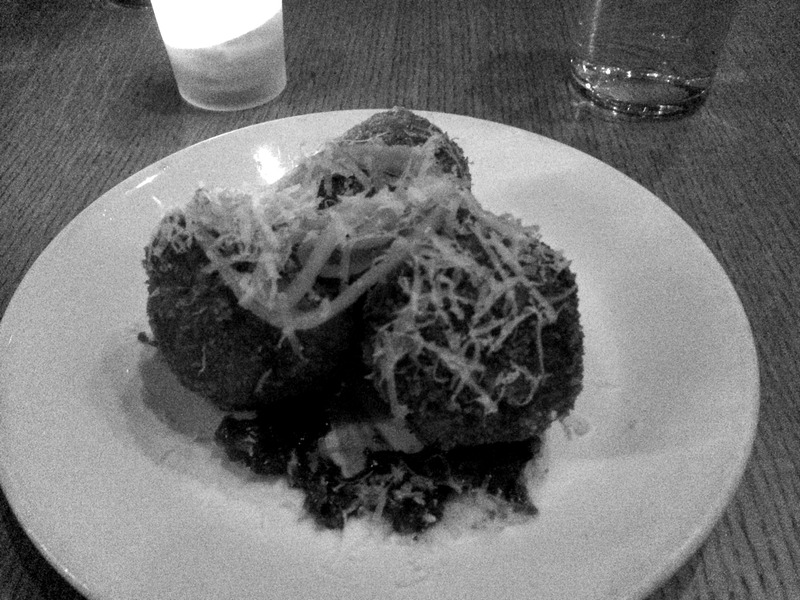 At the end of the meal, we agreed our favorite dish was the Oxtail Crouquettes. But now, a few days later I’m thinking about the soup and salad the most. As for the rest of the experience, I had an excellent time. I had a fantastic tequila cocktail, and the atmosphere was lovely. It’s big and spacious but it feels cozy! There are candles everywhere making it very romantic. Overall our night at 23Hoyt was great, I recommend . If you can’t make it for dining month consider their Happy Hour, that’s every day and Friday and Saturday late nights. OR check out one of the other 103 restaurants participating in Portland Dining Month.